Vincent Browne interviewed Garret on the occasion of this 80th birthday for Village magazine. The interview is republished here from the Village archive, which is part of Politico's subscription magazine archive. Subscribe here. Similarities exist between the move against Charlie Haughey and the challenge to Brian Cowen's leadership mounted this week by some parliamentary party members. Below is a feature by Vincent Browne that appeared in the February 1983 edition of Magill on how Charlie won the battle for the leadership. 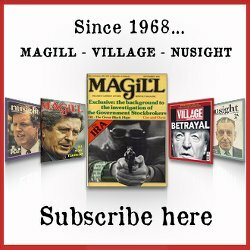 The Magill archive (1977 - 1998) is available here.